Established for over 12 years, All Aspect landscapers are garden construction experts in Newbury, Berkshire who offer professional quality with a personal and friendly approach, specialising in individual projects right through to total garden refurbishment. With expertise in garden design, decking, patios, all soft landscaping (planting schemes) and hard landscaping and any size retaining walls - built to British standard and regulations - all materials and tastes are catered for. So if you have a project in mind, no matter what the size, feel free to contact our landscapers for garden construction in Berkshire. Please have a look at our examples page for a range of past projects and to help you get an idea of how you can transform your garden. All Aspect Landscapers in Newbury offer Garden Construction in Berkshire and specialise in decking, patios, soft and hard landscaping in Newbury. 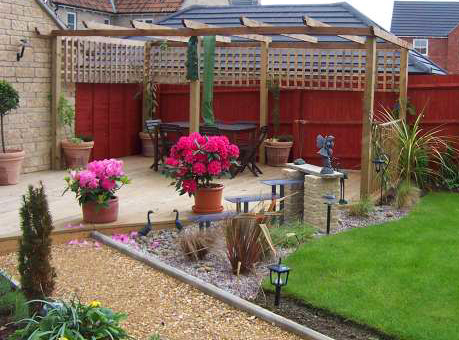 We offer total garden refurbishment of your private and or commercial outside living space.